The community is invited to celebrate with Marina del Rey as it marks its 50th birthday with a weekend of events and special activities, including L.A.’s MarinaFest. The Marina del Rey Birthday Bash celebration will be held Friday, April 10 through Sunday, April 12. Local businesses and hotels are also commemorating the community’s landmark anniversary by offering birthday promotions and specials. The Los Angeles County Department of Beaches & Harbors, in conjunction with the Marina del Rey Convention & Visitors Bureau, has created the series of special events to honor the momentous occasion and to help draw people to the historic Marina. During the weekend, celebrants can enjoy onboard tours of Tall Ships, cannon battles, day sails on Santa Monica Bay, harbor tours, kids’ activities, a boat and classic car show, local food trucks, fireworks and a free live concert by Three Dog Night. The weekend of activities will be held at Burton Chace Park, located at 13650 Mindanao Way in Marina del Rey. Times may be subject to change. Please check the website for the weekend’s full schedule. Tickets for the Tall Ship tours, can be reserved at ticketfly.com/event/791155. A variety of other promotions and discounts are available throughout the Marina at Hornblower Cruises & Events, Marina Grill & Bar at the Hilton Garden Inn, SALT at the Marina del Rey Hotel, Pizzarito, N.Y. Pizza by the Slice and Sinder Lounge at the Marina del Rey Marriott. Additionally, the Marina del Rey Convention & Visitors Bureau will hold an Instagram contest to help promote the weekend events. To participate, attendees should share their images of the Marina’s birthday festivities using #mdr50 and tagging @marinadelrey_ca. Ten lucky winners will receive a $50 gift card to a Marina del Rey restaurant. For more info about the Marina’s birthday celebration, including a full schedule of events, visit visitmarinadelrey.com/mdr50. 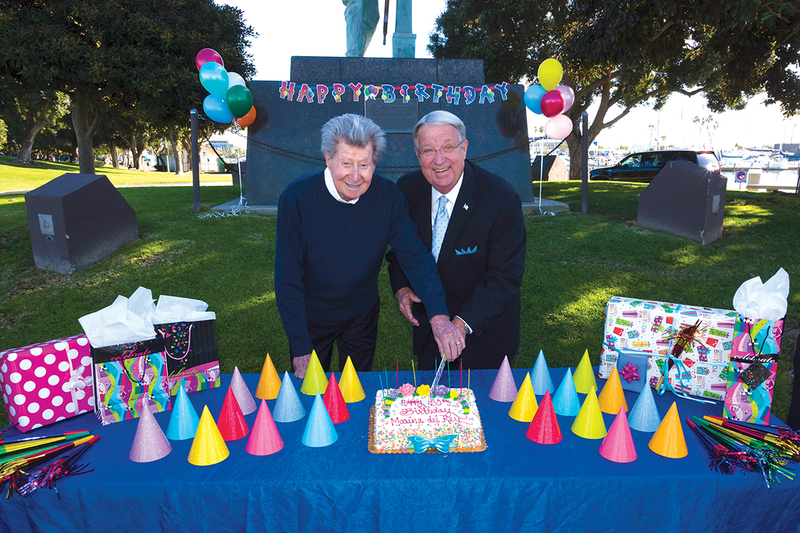 Photo: Jerry Epstein, one of the original developers, and Supervisor Don Knabe pose for a photo shoot to celebrate the Marina’s birthday earlier this year. PHOTO BY DAVID VOSS, COURTESY OF LAX COASTAL CHAMBER.